Trying to second-guess the impact of events such as Brexit or the recent stock market correction – or even attempting to make a bet on them – rarely pays off. Instead, investors who focus on long-term horizons – at least five to ten years – have historically fared much better. 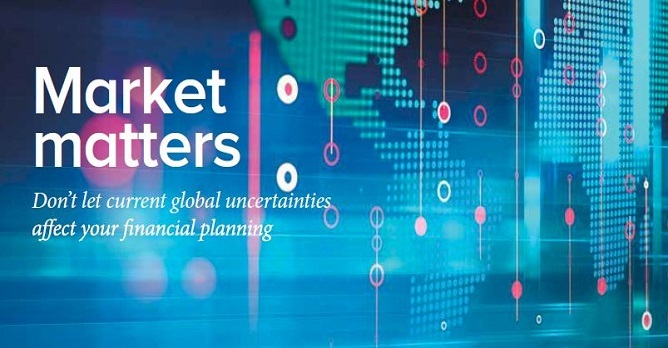 It’s important not to let current global uncertainties affect your financial planning for the years ahead. We look at why investors need to keep to their strategies and keep moving ahead consistently by spreading risk and growing their wealth for the long term. Without professional advice and careful financial planning, HM Revenue & Customs can become the single largest beneficiary of your estate following your death. We consider the findings of a recent survey about Inheritance Tax that shows many wealthy Britons over the age of 45 are either ignoring estate planning solutions or they have forgotten about the benefits these can provide. How prepared are you for any financial shocks? Over three million working couples are classed as ‘double income, no option’ (DINOs), which means they are potentially financially vulnerable if one of the two loses their earnings. We consider the scenario many couples could face without adequate savings or protection insurance if one of the main earners was unable to work for a period of time. We hope you enjoy reading this edition and invite you to contact us if you would like to discuss or review any area of your financial plans. Seize the day. Your wealth is your life’s work; helping you create, protect and preserve it is ours. To discuss any of the articles featured in this issue, please contact Helen Howcroft on 020 7713 9356.